ProOne Announces New Partnership with China-based Distributor Dongguan Bowang High Polymer Materials Technology Co. Ltd.
Oil & Gas Product News – CoilPro ProOne Boosts Coiled Tubing Production Results. ProOne Inc. Introduces RustProTM Rust & Corrosion Inhibitor. Oil & Gas Eurasia March 2015 “Innovative Drilling Mud Additive Saves Substantial Time and Money by Dramatically Reducing Downhole Friction”. ProOne is the Cover Story in the April 2015 issue of India’s No. 1 Oil & Gas Magazine, Drilling & Exploration World (DEW) Journal. ProOne Inc. Introduces Revolutionary Pipe On Pipe Treatment – CoilPro. ProOne in Oil & Gas Australia – New Products! ProOne Featured on Petro Energia – Maximum Well Cost Savings for Latin American Operators. 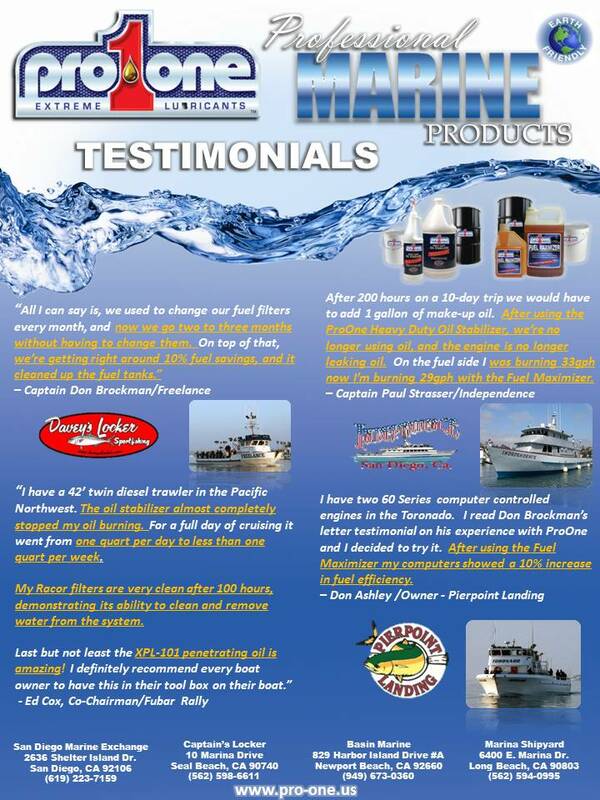 ProOne products used for Marine Industry summary of Testimonials. ProOne Fuel Maximizer by Davey's Locker Whalewatching & Sports fishing, Newport Beach, CA. ProOne Industrial Oil Concentrate by City Industrial Tool, Costa Mesa, CA. ProOne Heavy Fuel Oil Fuel AdditiveTest Report in conjunction with Yantai Sea Emergency and Salvage Bureau, China. ProOne EP-2 Multipurpose Grease by GL Conradie Plant HIre, Kuils River, South Africa. ProOne ACA Cutting Fluid by Webber Metals Inc, Paramount, CA. ProOne Products by Buena Park Tool and Engineering, Huntington Beach,CA.